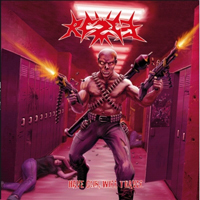 The German thrashers REZET are founded by the duo guitar players Ricky Wagner and Thorben Schulz in 2003 when both of them were still students. After the release of couple of demos and a self-released EP they signed a contract for their debut album. Mr. Wagner has chosen an intro from his classical namesake to open the album with the instrumental slaughter ‘Red Alert’. Immediately we could guess that DESTRUCTION have been inspiration of this band for a long time. With their speed and the particular vocals (of Wagner, but not that one…) almost half of the songs (tracks 1, 2, 3, 6) are with this cohesion. As the musicians themselves share the half of the songs are old, the rest are new. In the spirit of their name (coming from ‘reset’) yet in ‘Altar of Satan’ (the fourth track) we can hear modern influence and core rhythm. In the next song there is more melody and a lighter approach in the singing which replaces the DESTRUCTION influences with TESTAMENT influences. I definitely believe that the old songs in the album are the DESTRUCTION influenced. In the fourth and the fifth track the development is just alluded. ‘The Final Breath’ (the seventh song) starts as a ballad and spreads as 80’s heavy metal track, which retro sound is mentioned in the talks of the Germans that they had missed it during the new metal fashion. The last track ‘Fallen Angels’ is spinning around speed originals of METALLICA and OVERKILL from the 80’s as well. The weak points of the album are the guitar solos. One of the guitars proposes us a non-fresh reading of solos from the type of the early SCORPIONS/ACCEPT. The other guitar walks over the scale without any particular sense and frequently at the end of these solos it even goes out of tonality. These faults come to ear with compulsiveness in the seventh song which is slower and longer than the others. Although they can be compared with the titans in gendre REZET must work over the quality of their songs. They are fresh blood in the library of records of the collectors, but still they are not inspiration. The LP from High Roller Records is with new cover artwork, a surprise for the fans. The original CD is decorated as if with a photo taken from a war computer game.